And today we have the first in yet another series I had heard much good about but avoided picking up for a variety of no good reasons. I think my reluctance stemmed somewhat from an uncertainty as to just what kind of series Michelle Sagara's Cast series was. I think at first I had the impression it was a paranormal romance, possibly an urban fantasy (the covers influenced me this way). 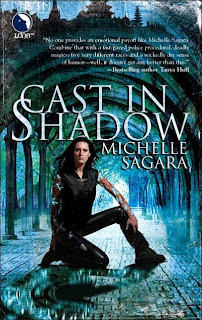 A few chapters in I was surprised to find Cast in Shadow much more a mix of dark and high fantasy, peopled with a smattering of solid gold, humorous, and truly sinister characters living in a fully developed, layered, and fascinating world. Kaylin Neya is a Hawk. The youngest of that number, in fact. In the city of Elantra, the Hawks are charged with policing the streets and guarding the citizens. They share that responsibility with their sibling organizations the Wolves and the Swords. Together the three forces are headquartered in the Halls of Law. Elantra's citizens are made up of a mix of humans like Kaylin, winged Aerians, furred Leontines, and the immortal Barrani. Seven years ago Kaylin left a life of squalor on the streets of the fief of Nightshade, gave herself a new name, and made her way to Elantra in search of a fresh start. Now her past has caught up with her as a series of murders takes place in Nightshade. Disturbing in their own right, they also bear an eerie resemblance to events in Kaylin's past she thought for sure she'd left behind. His face grew more stonelike. "I have been waiting for half of a day, Kaylin. Would you care to offer an explanation for the waste of my time to the Emperor?" Her shoulders fell about four inches, but she managed to keep her head up. "No, sir." He frowned, and then turned toward the distant curve of the shadowed room. In it, she saw a small well of light. And around that light, a man. Some instinct made her reach for her daggers; they were utterly silent as they slid out of their sheaths. That had been a costly gift from a mage on Elani Street who'd had a little bit of difficulty with a loan shark. "I have, however, no intention of embarrassing the Hawks by allowing you to speak on their behalf. I have a mission for you," he added, "and because of its nature, I wish you to take backup." Great. She looked down at her boots, and the low edges of the one pair of pants she now owned that wasn't war-zone material. "Lord Grammayre--"
"That was not, of course, a request." He held out a hand in command, but not to her. "I would like to introduce you to one of your partners. You may recognize him; you may not. He has been seconded from the Wolves. Severn?" She almost didn't hear the words; they made no sense. Because across the round room--a room that now seemed to have no ceiling, her vision had grown so focused--a man stepped into the sun's light. A man she recognized, although she hadn't seen him for years. For seven years. In utter silence, she threw the first dagger, and hit the ground running. Yep. Still gives me the happy shivers. That's my kind of girl. This scene comes only a handful of pages into the book and I was completely invested from that point on. And I knew right away it would be the section I would quote in my review. Because that scene? Made of win. I loved this story and can't wait to move on to the next installment--Cast in Courtlight. Oh, I loved this one too! Thanks for the review! I was actually just looking at this one as a potential purchase last night but didn't know enough about it to want to get it. Now it's going on the wish list, though! Jennie, have you read any of the others? Kristen, you are welcome! I held off for similar reasons and am glad I finally gave it a shot. Now this looks really good. I hadn't heard of it, thanks for the review! Each time I come across this book in the store I pick it up, carry it around, then put it back before checkout. Mainly because I'm so iffy about starting yet another series. But now I think I'll go ahead and buy it, sounds like something I would enjoy. My pleasure, Amy. I've got the second one on my nightstand. I'll let you know how it holds up. Brie, lol. Sounds like several of us were doing the same thing, circling this series. Hope you do enjoy it! Angie, no I've read any of the others...they're on my list though! LauraJ, excellent. Nice that you have them handy! I'd like to hear what some other first time Sagara readers think. Great review! I also like strong heroines who can be soft about some things, too. It sounds like this one strikes a necessary balance. I think I have the first three of these TBR, but I haven't started any of them. Shannon, it's interesting how many of us have had copies of these sitting around but haven't started them. I really did love Kaylin. All of the side characters, too. I'm going to join the "I've had this forever and just couldn't get started on it" club. I just finished it today, and it was fantastic! Can't wait to get going on the rest of the series. I would love to link to your review when I post mine, if that's alright with you. Vanessa, plenty of room on the bench. :) And please feel free to link away! I'm glad you loved it. I just thought it was awesome. What a fun read - one of the best first-in-a-series books that I've read lately!